Our appraisal personnel have conducted appraisals for a variety of federal programs and for properties developed within the Low-Income Housing Tax Credit (LIHTC) program. In addition, VSI Appraisal Group staff has experience conducting appraisals for office, retail and industrial properties. They also have experience appraising mixed-use and special purpose properties, such as student housing, schools and hotels. Dave Ross is President of VSI Appraisal Group with over 20 years of experience in real estate consulting, development and valuation. He has worked for a national appraisal company, a national syndicator for Tax Credit housing, a commercial real estate developer and a market research consulting firm. Mr. Ross is licensed in multiple states as a Certified General Real Estate Appraiser. This broad range of experience has allowed Mr. Ross to become familiar with most types of real estate and gain local knowledge of markets throughout the United States. Extensive knowledge of LIHTC markets has resulted in invitations to speak at industry conferences. Mr. Ross has experience conducting commercial real estate appraisals for multifamily (market-rate and restricted rent), office, retail, industrial and mixed-use properties. Mr. Ross has an MBA from Capital University and a BA from Wright State University and is a Fellow with the Royal Institute of Chartered Surveyors (FRICS). Mr. Ross also holds the MAI designation from the Appraisal Institute. Brian Walsh is the Vice Prsident of VSI Appraisal Group with over 10 years of experience in real estate development and valuation. Mr. Walsh is a Certified General Real Estate Appraiser. He has worked for an affordable housing developer, a national commercial real estate brokerage and a national real estate valuation firm. Over this time, Mr. Walsh has conducted market feasibility studies and appraisals on multifamily, retail and office developments in 38 states. Mr. Walsh earned a bachelor's degree in marketing at the University of Wisconsin, Oshkosh. Mr. Walsh is a Candidate for Designation with the Appraisal Institute. Mr. Gupta is an Appraiser Assistant with VSI Appraisal Group and has been active in real estate since 2014. Sameer previously worked in real estate market feasibility as an on site market analyst and co-authored over 50 market studies in 35 different states across the United States; which has given Mr. Gupta a firm understanding of market analysis and market trends in the real estate market. Mr. Gupta holds a Bachelor of Arts degree from the Ohio State University. Mr. Adams is an Appraiser Assistant with VSI Appraisal Group and has a diverse background of employment in Real Estate Analysis, Sports and Recreation and Higher Education Administration. 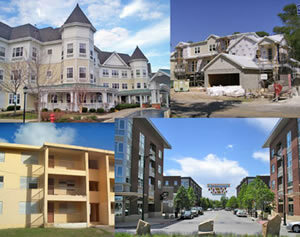 This includes over four years of real estate market research and property valuation in over 100 markets in 35 states. He holds both a Bachelor of Arts in Economics and Master of Business Administration from Otterbein University in Westerville, Ohio. Mr. Palma is an Appraiser Assistant Trainee with VSI Appraisal Group and has been active in real estate since 2016. Philip previously worked in real estate market feasibility as an on-site market analyst and co-authored over 30 market studies in 15 different states across the United States; which has given Mr. Palma a firm understanding of market analysis and market trends in the real estate market.